1817. The third adventure featuring identical twins, Peter and Paul Skillen, begins at an illegal duel where Paul is acting as a second to a man he has been teaching how to shoot. He fears for his friend, Mark Bowerman, who is taking on an experienced duellist. As it happens, the event is interrupted by the Bow Street Runners who take a special delight in arresting Paul, their old rival. Bowerman had challenged his opponent to a duel to defend the honour of Laetitia Somerville, to whom he is engaged to be married. Desperate to get rid of the man who stands between him and his beloved, Bowerman’s brave promises are in vain. He is murdered one evening in the garden of an empty house. Peter and Paul Skillen immediately begin a search for the killer. Hampered by the Bow Street Runners and facing great personal danger, the brothers have to pick their way through a mystery that deepens at every turn. They get an insight into the laws of inheritance and into widespread political corruption. The twins need all their resourcefulness to solve their most complex case yet. Set in 1816, the second book in the Bow Street Rivals series gives a dangerous assignment to identical twins, Peter and Paul Skillen. In trying to solve the brutal murder of a political satirist, they come up against powerful enemies. They also have to cope with some startling surprises about the deceased. Since his prints were sold by the ebullient Diane Mandrake, they have to act as bodyguards to the lady when she and her premises come under attack. And all the time, they are dogged by Micah Yeomans and the other Bow Street Runners who believe that they are the only legitimate guardians of law and order in London. The Skillen brothers survive all kinds of setbacks – including a violent encounter in a prison - as they follow a tortuous trail that eventually takes them all the way to Paris for a final and deadly confrontation. After a successful stay in Carlisle, Moscardi’s Magnificent Circus sets off for Newcastle in two separate trains.When the first of them is derailed, there is chaos. While the circus folk lick their wounds, a search is conducted for a monkey who fled the scene of the crash. The animal is eventually found but not before it has given the search party a fright beside the shallow grave in which a murder victim has been buried. The bizarre murder of a railway policeman takes Colbeck and Leeming to Dorset in what they believe will be a straightforward investigation. Colbeck is keen to solve the crime quickly because his wife, Madeleine, is due to give birth within a few weeks. His hopes are soon dashed. The murder victim had many enemies so the list of suspects is a long and varied one. The case takes the detectives all over the county and puts Leeming in great danger. Just when they think they have unmasked the killer, there is a sudden turn of events that throws them into disarray. The situation is complicated by the unexpected arrival of Superintendent Tallis. As the detectives finally begin to make progress, Colbeck hears that his wife has been rushed into hospital. He has to dash back to London, leaving the sergeant with the honour of tracking down and arresting the culprit. Inspector Marmion and Sergeant Keedy try to catch an escaped prisoner. They arrested Wally Hubbard after he set fire to the house owned by the man who seduced his daughter, abandoned her when she got pregnant and showed no regret when the child was stillborn and the mother died of complications during the delivery. 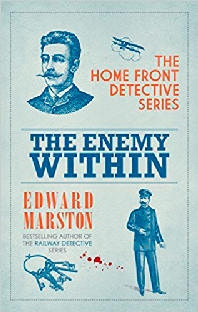 To get his revenge on Ben Croft, the father of the child, Hubbard breaks out of Pentonville and goes in search of him. The detectives also search for Croft but he's nowhere to be found. Marmion's brother, Raymond, picks up a man sleeping rough and takes him to the Salvation Army hostel he runs. The only name the man will give is David. When he's murdered at the hostel, however, they find papers that identify him as Ben Croft. The mystery thickens when Marmion sees the corpse and says that it is certainly not Croft. He and Keedy have to find out the murder victim's real identity and locate Croft so that they can protect him from Hubbard. The parallel investigations take them in all sorts of directions. At a time when he's working around the clock, Marmion discovers that his son, Paul, has left home without explanation. A separate search is mounted. A story that mingles detection with espionage moves to a thrilling climax at Knockaloe, the vast camp on the Isle of Man for civilian internees.